Chocolate clams, dolphin pods, and sustainable fishing. Waking up to a view of ocean and islands and sunrise may be the ultimate luxury. And the night sky. Millions of stars visible in the absence of light pollution, with Venus so bright its light reflects on the sea just as the moon. This was my first time on a boat trip like this – 5 days on the Lindblad/National Geographic Sea Lion off the coast of southern Baja. 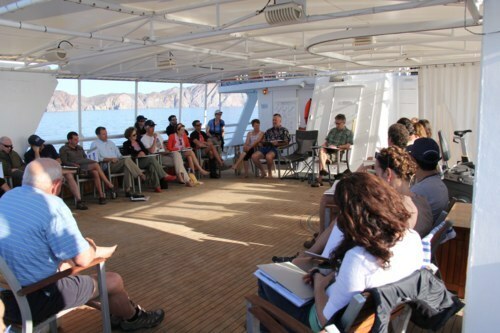 I was there at the invitation of Rare, which had organized a “Symposium at Sea” to bring together scientists, policymakers, resource managers, businesspeople, and philanthropists for a robust brainstorming session about their new initiative. Rare’s conservation model is to create community-based campaigns, called Pride Campaigns, which support local leaders and build public support for conservation using iconic local species. Their new initiative is still in development, but vaguely the plan is to leverage Rare’s expertise with Pride Campaigns for sustainable management of small-scale fishing by combining Pride Campaigns with no-fishing reserves, and with establishment of property rights for local fishers over their local fishing grounds. Thereby, the Pride Campaigns would build community support, the reserves would help replenish the fish populations, and the property rights would promote stewardship and sustainable practices outside the reserves. Very reasonable, but as always, the devil is in the details. Hence, the Symposium, and, perhaps more significantly, the burgeoning partnership among Rare, Environmental Defense Fund’s catch share program, researchers from University of California, Santa Barbara, and California Environmental Associates. As an inter-disciplinary intellect, I’m always excited by collaborations like this, and see great potential here. But this trip was not just symposing. Between the discussion sessions expertly facilitated by the Aspen Institute were incredible snorkeling and hiking jaunts. We hiked from beaches to peaks on uninhabitated islands, then refreshed ourselves with swims. We visited Cabo Pulmo, a community-managed and enforced no fishing area that contains the Northernmost reef on West coast of the Americas where we snorkeled with large multi-tealed parrotfish, and a milling school of a thousand 2-3 foot jacks. Swimming with that school of was one of my most awe-filled snorkeling experiences. They were in 60 foot deep water with 20 foot visibility, looking like a delicious meal. I was waiting for a shark to burst up from the depths to assert its predatory dominance. But I’ll pretend I got back in the boat somewhat quickly solely because of the chilliness of the water. Lesson: marine protected areas can work to restore and protect ecosystems. We also snorkeled at a sea lion colony. Large, lumbering and thigmotactic (my new favorite word, similar to cuddly) on land, they are enormous and graceful underwater. They swim like elongated footballs, with a spiral even more elegant than my throw (shocking, I know). However, it was heartwrenching to see several young sea lions with fishing line around their necks, clearly cutting into their flesh as they grew. Ocean protection takes much more than just no fishing zones – activities outside of such zones must also be managed because both creatures and pollution know no boundaries. The heartwarming counterbalance to that was the afternoon spent on a beach near Loreto visiting the community of a Rare Pride Campaign. Local Rare staff had organized a panel of local fishers and organizers of fishing cooperatives. They were incredibly well-spoken, explaining how they organize themselves, enforce the reserve and restrict use by non-locals, and market their products. Their business acumen regarding value-added products (e.g. ceviche) and supply chain control (e.g., they are selling direct to Los Angeles) was impressive – especially in that it arose organically. We witnessed the signing of an agreement between several cooperatives to become partners regarding enforcement. The community seemed to really take ownership/pride in this project. And the children were very engaged. At the end of a puppet show featuring hero Pescador Responsible, the children chanted along “I will only eat legally caught seafood,” and they ran to hug the chocolate clam mascot when it appeared. Hopefully with Rare’s new initiative this scenario, perhaps even down to the beach BBQs with Michael Jackson soundtracks, will be replicated around the world. And, this. So many dolphins.